Looking for ways to boost your e-Commerce store sales growth? The internet is changing the way people buy new things. The days of the brick and mortar stores seem to be almost a thing of the past. People can officially buy anything online nowadays, from groceries to medical treatments. With so many businesses popping up all over the internet, it’s harder than ever to start out with your e-commerce website. Whether you’re turning your blog into an e-commerce website or you’re starting from scratch, you need to be seen. There’s a lot of noise on the internet. The average internet user sees so many adds just by scrolling through Facebook. How do you get noticed with so much competition? 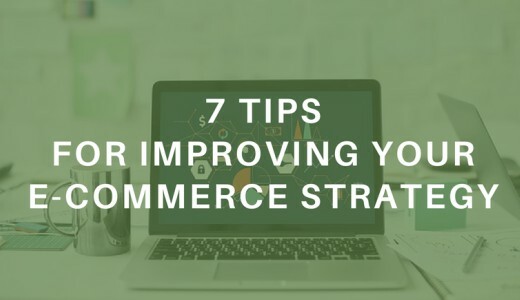 These 7 tips for improving your e-commerce strategy will explain just how to get your website seen by the right audience. If you don’t know who you’re talking to, how will you know if anyone is listening? The first key to improving your e-commerce strategy means knowing your audience. It’s not enough to have a rough guess about your audience’s age and interests. If you want a real understanding of your audience, you need to know them on an intimate level. Dig deeper when thinking about your ideal audience. Picture your ideal customer as a single person instead of a group. Who is he or she? Where does he or she shop? What are his or her habits? Break down different aspects of your ideal customer’s life, background, and buying habits. Once you understand your ideal customer on this level, you can create a strategy designed just for them. Your e-commerce website needs to be able to compete with other big-name websites. What’s keeping people from choosing a brand like Amazon over yours? You need a website that’s easy to use for typical shoppers. When testing usability, you can’t think of a website owner, you have to think like a shopper. What would your ideal customer search for? What information do they want to know? Does everything appear correctly on different screen sizes? What about mobile devices? Get in the habit of testing usability regularly. The marketing blog Kissmetrics saw that almost half of mobile users expect websites to load in two seconds or less! If your website isn’t functioning quickly, you’re going to lose users. The same goes for broken links or pages. If something isn’t working right, users won’t stick around until it’s fixed. People make emotional buying decisions. They act quickly, and they might buy things before logic catches up to them. This is good news for e-commerce businesses who can speed through the checkout process. If a customer isn’t able to quickly pay for their cart, they might lose interest. To make it easy as possible for customers to pass along credit card info safely, offer a variety of payment options. For more help, read this guide by ExpertSure for setting up merchant accounts. People trust other people. A great way to improve your e-commerce website is to make it easy to read and leave reviews for products and your company. Most people easily trust buying from Amazon simply because so many other people use Amazon. Because people are buying things online that they can’t physically see in person, you need to help them feel secure in their choice. Nothing scares people away from an e-commerce website faster than a lack of reviews! Not only should you make it easy for customers to read reviews, but you should encourage customers to leave reviews after a purchase. You can do this through social media or through follow-up emails. If you accept reviews, be willing to go out of your way to rectify negative situations. Negative emails can kill your reputation as a business, so do your best to have positive interactions with customers. Though the internet is supposed to connect people, it seems like there are more walls than ever. E-commerce websites sometimes read as robotic, and that’s why business owners need to focus on their own humanity. Customer service is a way to break through this robotic mold and show that there’s a real-life human being behind the website. Customer service can make the difference between a purchase or a loss. When people feel heard, they’re more likely to recommend a business. Zendesk, one of the leading customer service platforms, says 85% of people are willing to pay more for a great customer service experience. This is reason enough to make it a priority! It’s not enough to just have your e-commerce website. If you want to be competitive nowadays, you need to be active on social media. Social media gives you another chance to interact with customers and build relationships. When posting on social media, try to keep your tone conversational and helpful. Avoid sounding like a salesman. Nobody likes to feel like someone is reciting a pitch to them. Keep the focus on the user, not on the products. Finally, customer feedback is one the most valuable tools for e-commerce websites. Common problems faced by e-commerce websites are abandoned carts, low conversion rates, and technical glitches. You might not even be aware of a problem until you ask about it. Clientheartbeat.com shares easy ways to actually measure your customer satisfaction. Encourage users to give feedback if they fail to purchase or even after a purchase. They’re really your best source of information on what works and what doesn’t! In a few years, e-commerce websites will likely be the new normal when it comes to shopping. More and more business owners are jumping on this trend while it’s hot. With the rise of e-commerce websites in 2018 comes more competition. Luckily, the right strategy will keep you standing apart from the crowd. The most important thing to remember is that it’s not about your business, it’s about the customer. Are you ready to take your e-commerce business to the next level? Get started with the 7 tips above today!